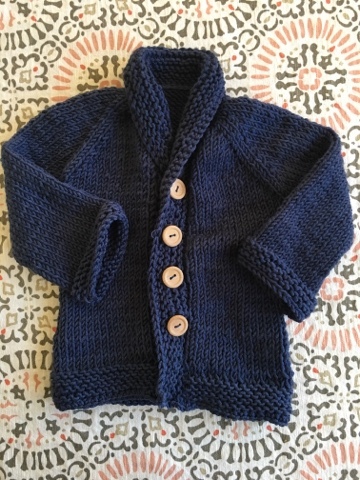 Another cardigan went on its way to a dear sweet baby boy. I dubbed this the "lil professor" sweater as it will be worn by the son of none other than our dear friend the professor. I have been calling this the baby boy grampy sweater but "lil professor" has a nice ring too. A great go to jacket for boy babies. It's a quick knit, relatively seamless and does turn out to be a great addition to any boy's wardrobe. 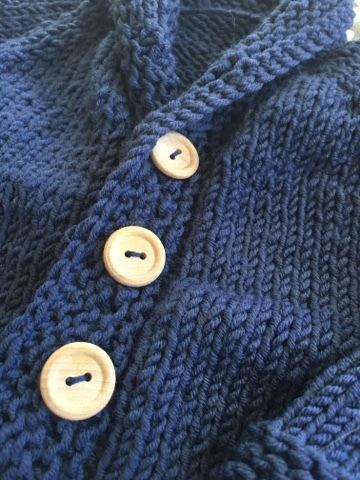 The unfinished wooden buttons were not my first choice for this sweater. I had lovely red stained wooden buttons in mind they would have been so striking with this blue yarn but alas they were too large. I'll save those buttons for another project. I have such a good supply of more feminine buttons so I'm going to need to find more masculine options to have on hand. Which is why I bought a bulk order of unfinished wooden buttons. The pattern is the Baby Sophisticate sweater knit in Artyarns Ultramerino 8 in color 252, a discontinued yarn. I bought this yarn years ago and I think I ended up with 8 skeins of it. The yarn was super discounted which is why I bought so much. Initially the yarn was meant to be used to make a shawl but I never found a pattern that matched my skill level at the time. I am so glad I have been able to put it to good use as the color is such a great deep blue. I'm happy to report that after several baby gift projects this sweater makes the last of the yarn. The yarn meant for one thing has become many wonderful garments. Now I can't wait to see if this fits that adorable baby boy.